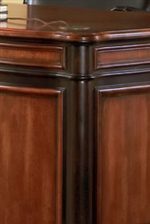 This double pedestal credenza desk and hutch is made of hard wood and veneers, for a sturdy construction and long life in your traditional home office. The secondary work surface features spacious storage drawers, with three drawers in both the right and left pedestals. The matching hutch features task lighting to make your work easier, with two beautifully curved glass doors, with two shelves each inside, ideal for storage and display. Two large center shelves offer more space for books and other decorative items. Finished in a rich two tone wood finish, with clean lines and classic molding, this elegant kneehole credenza and hutch will be the perfect addition to your home office. 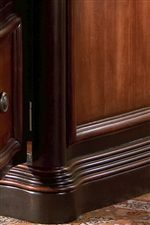 The Pergola Traditional Kneehole Credenza and Hutch by Coaster at Carolina Direct in the Greenville, Spartanburg, Anderson, Upstate, Simpsonville, Clemson, SC area. Product availability may vary. Contact us for the most current availability on this product. 800500 Credenza 1 73" 26" 30"
800501 Desk Hutch 1 75" 18" 52.75"